Indiana Line - perhaps - isn't exactly the first name that comes to mind when thinking at Italian loudspeakers Companies...if you're not Italian! Actually, this Company, located near Turin, is one of the most popular here in Italy, making and selling loudspeakers since 30 years or so. They started their business back in the Seventies and their products have always been extremely welcomed by audio buffs, especially those of the budget-conscious type. Recently Indiana Line has introduced a new series of loudspeakers, called Arbour (to remind the fact they're finished in real wood), that should aim to suit serious listeners' tastes while keeping the usual quality/price ratio high. This series of speakers includes 5 models (2 floorstanding towers, 3 bookshelf), 1 center channel and 1 subwoofer. The models under test are two small bookshelf loudspeakers, the bigger 5.30 and the smaller 5.40. These have been tested head to head because they have so many things in common: first of all they use the very same drivers (+ 1 secondary woofer for the bigger 5.30) and, secondly, very similar cabinets and passive components. I was very interested to discover IF (and WHAT) this additional woofer added something to the performance of the smaller 5.40 model. Both loudspeakers are of the bass reflex kind...with a difference. The reflex port fires towards the stand (mod. 5.40) and towards the foot of the speaker (5.30). In the first case the speaker is equipped with 4 rubber spikes, long enough to leave "room" to the reflex port the breathe freely. This solution helps minimizing the interactions of the reflex port's turbulent air flow with near walls so that the speakers can be placed virtually anywhere. Of course this isn't 100% true, since we know every near wall interacts, if not with the reflex port, with the sound of the speaker as a whole, both in terms of tonal balance and 3D imaging. Moreover, if you haven't had enough of strange things, the tweeter and the woofer are installed upside down, tweeter below the woofer, that is. This isn't a new concept as many manufacturers did the same in the past (for example, Mission). It should help keeping the tweeter's height LOW when the loudspeakers are placed too high with respect to the listener's ear. This happens frequently when one places the loudspeakers on bookshelves. As said, the two models use the very same drivers, a soft dome 1" silk tweeter and a 13 cm double-magnet woofer (2 units in the 5.30 model). The double magnet helps minimizing the magnetic field outside of the speaker, so to make these loudspeakers ready for near-TV use in Home Theater sets. The bigger model allows biwiring by means of good quality gold plated binding posts that can accept forks, bare wires or bananas. A golden plate in the rear reminds us these speakers belong to the "audiophile" series of the Company. The quality of the finish is OUTSTANDING and way above average for this price range. 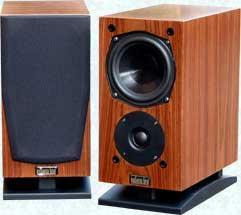 Furthermore, being small and nicely finished, the WAF factor of these speakers is stellar. Installing a pair of these babies into any living room will NOT cause a divorce. 3 ways, bass reflex enclosure, bookshelf or standmounting type. Woofer: 2 x 130 mm., composite membrane, rubber suspension, shielded magnet. Tweeter: 1" (26 mm) soft dome (silk). Neodimium magnet, ferrofluid-cooled voice coil. Power handling: 70 Watt RMS - 120 watt peak. 2 ways, bass reflex enclosure, bookshelf or standmounting type. Woofer: 1 x 130 mm., composite membrane, rubber suspension, shielded magnet. Power handling: 40 Watt RMS - 80 watt peak. As you can see, both speakers offer a very high sensitivity, considering their small size. This means they can sound loud even with few watts of amplifier power output. Also, you may have noticed the crossover network frequency between midwoofer and tweeter is exactly the same for the two models (3100 Hz) while the second woofer of the 5.30 works in a extremely limited frequency range (from 46 Hz @ -3dB till 70 Hz), more or less like a real (sub)woofer. The presence of this second woofer helps improving the bass frequency response (almost + 10Hz at the -3dB point!!!) and the sensitivity as well (+ 1 dB overall). The list price puts these speakers into a quite large market niche, that of "extremely entry-level speakers with audiophile ambition". The target may be a generic Music Lover on a budget (a kind of audiophile wanna-be) or any Home Theater enthusiast with severe WAF problems. 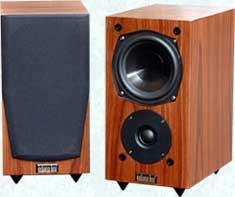 These Indiana Line Arbour 5.30 and 5.40 have been extensively tested on two different HiFi systems. The results have been, for several reasons, quite surprising. The tonal balance of these speakers - in particular the bigger 5.30 - is slightly of the "loudness" type with bass and highs a little above the rest. This doesn't come as a surprise, considering the target. I was prepared to this. The 5.30 model, thanks to the double woofer, offers an extremely powerful and extended bass range (considering the diminutive size of the cabinet) and it is very difficult to criticize this performance from the quantitative point of view. 46 Hz @ -3dB (claimed, but also tested by ear, approx.) is a performance that leaves no room to further discussions. There are few speakers of this size that can do better and - as far as I know - none of them is into the same price range. Of course, articulation of the bass range could have been better. The bass appears, from time to time, a bit boomy, especially in the 80-100 Hz region, where the two woofers work almost together. Indeed, though the secondary woofer has been cut at 70 Hz, it still delivers acoustic energy above that frequency. From this point of view the smaller and lighter 5.40 model is much better. Less weight, less bass depth...but better articulation and control. The mid range of the bigger model appears a bit shy, recessed. Hence vocals and certain instruments (guitars, for example) are a bit behind the rest. This is not the case for the smaller 5.40, which appears more coherent and linear. Don't get me wrong, I'm not saying the 5.30 has a boxy sound. Rather, I'd say its sound tends to be mellow in the mids. It somehow lacks authority and aggressiveness. In the mid-high range the situation changes a little bit as the level increases, hence giving that kind of "loudness" balance I've described above. Immediately above, just in time to avoid a tizzy sound, the sound becomes smooth again so, while you lose some higher harmonics you end up with a definitely bearable balance. Anyway, this behaviour can be slightly tuned by the owner simply varying the height of the speaker and the position of the tweeter with respect to the listener's ears. The smaller 5.40, at the end of it all, appears more tonally balanced and coherent. The bigger 5.30, though more complete, seems like it tends to overdo, trying to impress the listener. I've no doubt the casual listener would prefer the 5.30. As said, considering the diminutive size of these 5.40 and 5.30, their sensitivity is quite high at 90 and 91 dB respectively. This means the drivers which have been used are quite lightweight and also powered by strong magnetic fields. Hence, as one may expect, they perform very well in the dynamics department. Even some torture tracks I use to test the performance of a speaker have been played with the ease one can expect by bigger and more expensive drivers. Especially the 5.30 sounds very convincing in the bass. Both seem to prefer mid-to-high listening levels where they can show good impact and unexepcted grunt. Do not expect miracles...but the 5.30 may surprise more than a listener. Just for the records, the subtitle of this review is exactly taken by the song "Neon knights" of the cited album by Black Sabbath. The smaller 5.40, despite its dynamic behaviour - in the bass - can't rival that of the bigger 5.30, sounds more linear. For example, electric guitars appear far more realistic. Anyway, the 5.40 is well suited for small listening rooms and entry-level HiFi systems. Once you get accustomed with the inverted position of woofer and tweeter and you've found the right position into your listening room these small 5.30 and 5.40 will reward you with a quite realistic 3D soundstage. Not exactly the wide scene you can get from hi-quality minimonitors (of course!) but still something - at least - geometrically proportioned. The depth of the image, especially with the bigger model 5.30, is noticeable, considering the price range. Many speakers into this price range simply FAIL to create a soundstage (see, for example, my review of the Infinity REF 1 mkII)...so, chapeau! Provided the recordings are good enough, the 3D scene lives in the space behind the speakers and floats around them, with a good focus. The height of the image, despite the unusual position of the tweeter, isn't low as one may expect. In any case, it mainly depends on the height of the speaker stand you'll use. This is a parameter that allows you to find the right compromise between tonal balance and width of the soundstage. Even toe-in may help. Again, do not expect miracles...these speakers are just an easy way to start understanding and discovering what 3D imaging is and why audiophiles consider it so important for a realistic sound reproduction. The designer did everything he could to make these loudspeakers bookshelf-friendly (the position of the reflex port, the inverted tweeter etc.). Despite his efforts I strongly suggest to place these speakers on stands, in order to get their real sound. Of course, you can place them on your bookshelf and live happy but you will be enjoying just the 50% of their performance. In any case, these are some of the easiest speakers to use inside a bookshelf (as far as I know). Choosing the right amp isn't a problem: a small audiophile integrated amp will suffice. Even a 20 watter could be powerful enough to get loud listening levels inside a mid-sized room. The 5.30 model, thanks to its easy load and friendly sensitivity, can successfully used with low powered tube amps, provided loud listening levels are not frequently required. Just two words on break-in, as usual: let these speakers play for a while before evaluating them. 50 hours are usually more than enough. The 5.30 model, thanks to its deep and powerful bass response can be used as a stand-alone loudspeaker, no need to add a subwoofer (HT systems aside). The designer suggest to use the 5.40 with a subwoofer though I don't 100% agree. If the scope is the creation of a cheap HT system, that's OK, but in a traditional 2-channel system I'd avoid using them as pure sats. These speakers just need a small room and careful installation, not a subwoofer. Why? It's that simple: adding a subwoofer is always difficult as it usually damages the coherency of the speakers. Also, with the same amount of money (sat + sub) you may buy - for example - a floorstanding tower, with all the bass you want and with a more coherent sound (not to mention the easier installation!). Considering the list price there's no serious complaint I can make. The quality of the manufacturing and of the finish is WAY above average. While vinyl finish is mandatory in this price range, these Arbour's use a slick real wood finish. You could easily think these speakers are much more expensive than they really are, just judging by the looks. Personally, I've found these speakers really nice...and the low-res pics don't tell the truth, the speakers are way nicer than they appear there. The "upside-down" position of woofer and tweeter forces to use higher than usual speaker stands. This means your old speaker stands (if any) may not suffice. Anyway, even with standard stands (55-60 cm), the tweeters don't show unbearable variations of their off-axis frequency response. And there's a price to pay. More precisely, the bass range of the 5.30 is extended and powerful but lacks a bit of control and articulation. Moreover, with really deep bass frequencies one can distinctly hear the noise of the air flowing violently through the reflex port. This is normal with ANY reflex system but sometimes designers are able to minimize it. With the 5.30, considering the short reflex duct and its recessed position, it was nearly impossible to do better. The recessed mid range can be forgiven quite easily, if you consider the price range of the 5.30. Anyway, the less expensive 5.40 does better and appears to be more linear. Of course, this lacks the impact and the bass of the bigger 5.30. This means that you should choose the model you prefer, considering your needs (more bass and impact or more coherence?). Considering the well established tradition of this Company it doesn't come as a surprise the fact it has been able to offer a nicely built and finished loudspeaker at an unbelievable low price. Anyway, though extremely easy to find anywhere in Italy, these speakers aren't distributed worldwide. Luckly, the official website is also available in English so you may refer to it for more infos on availability of Alcor/Indiana Line products in your Country. They also have a very good online customer care service and offer a lifetime warranty on their products. Your comments on the sound of our speakers, so precisely highlighted, are confirmed by our measurements both in room and in near field. The 5.30 model has, by designer's choice, a loudness-like balance because of the two woofers playing together in the region 70�100 Hz. For this reason we have been forced to increase the level of the tweeter as well, to counterbalance the increased sensitivity in the bass. Your positive findings confirm my choices. Especially when listened at low levels, as usual when one lives in a flat, for example, the balance of the speakers makes tone controls useless. To get the right aggressiveness of electric guitars, as you mentioned in the review, one needs high listening levels, which are almost impossible to attain in normal conditions (consider your neighbourhoods :-) ). The 5.40 tonal balance, instead, has been kept as audiophile as possible so to make it a good choice when partnered with one of our subwoofers (mandatory in a home Theater environment). Both loudspeakers offer a very easy load to the amplifier, thanks to the absence of nasty phase rotations. As esplained in the owner's manual, one just needs to use a good amplifier. The binding post allow the use of any kind of termination. When using heavy gauge cables I recommend checking the posts from time to time, in order to prevent unwanted loosening. If you prefer bananas I recommend those of locking type.